Raggedy Ann and Andy were storybook characters created by Johnny Gruelle in the early 20th century. They are the most popular dolls of all time, and have been mass produced by a series of companies under license since 1920. This McCall pattern, copyright 1940, was the first one published for home sewers. 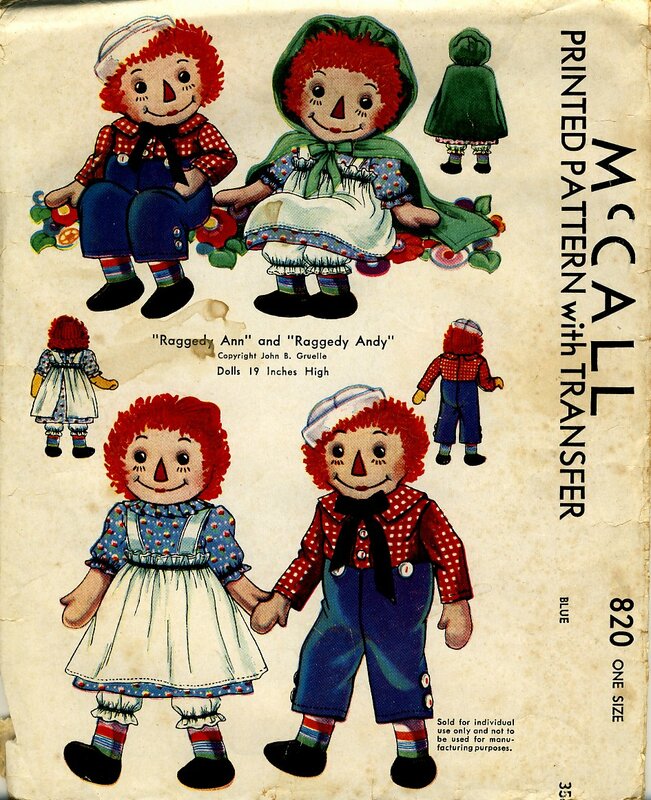 It makes 19" Raggedy Ann and Andy dolls wearing their usual outfits, plus a hooded cape for Ann. 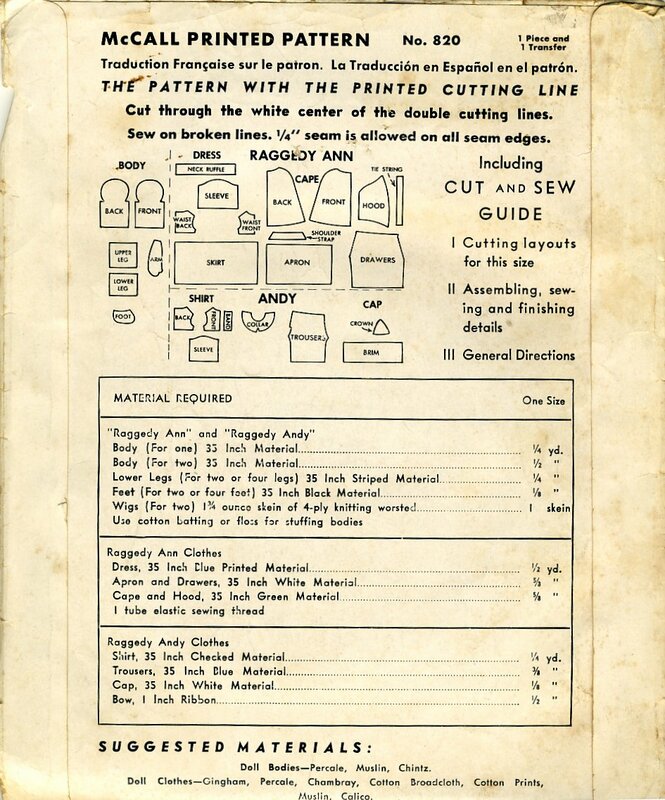 When the pattern was reissued in the fifties, McCall's used the same stock number (820) but the envelope has a different illustration. Raggedy Ann and Andy here have the same separated pancake style construction that has been used to make the commercially available dolls for generations. They have oversized mitten hands, yarn hair and button eyes. Transfers are included for their embroidered facial features and the hearts on their chests. The maker is instructed to use striped fabric for their lower legs and black for their feet, just like the store bought dolls. 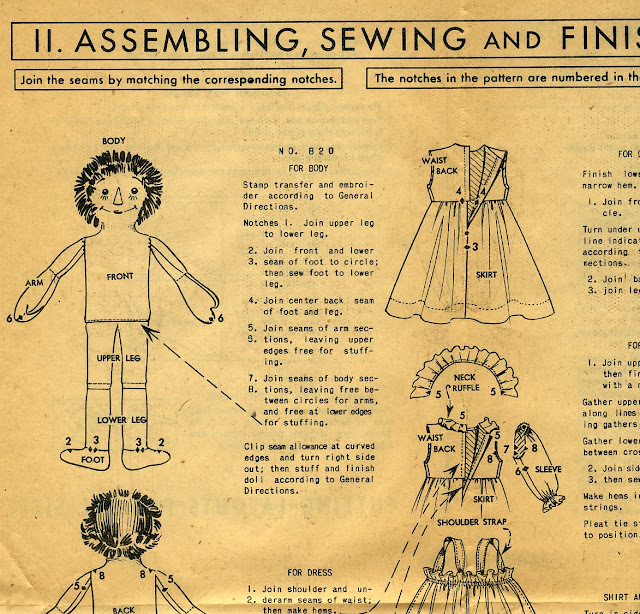 Raggedy Ann's outfit includes a dress with set in sleeves and a pleated ruffle at the neck; drawers gathered below the knee; an apron; and the hooded cape. Raggedy Andy's shirt and trousers are sewn together to make a one piece garment. His sailor cape and black tie complete his outfit. These dolls are classic Americana. What more can be said?